In April, 2006 my hubby surprised me with a week long trip to Paris (and not Paris, Texas!). It was everything I had dreamed it would be and so much more. The French are known for their food but we opted not to eat at fancy restaurants because of the price. One of our favorite meals was to buy a demi-baguette, a hunk of French fromage (the smellier, the better! ), fresh grape tomatoes, a few slices of jambon and a bottle of inexpensive vin. We would then find a park and eat on the grass while people watching. So fun! Another must in Paris was to eat a crepe that vendors would sell on the street. 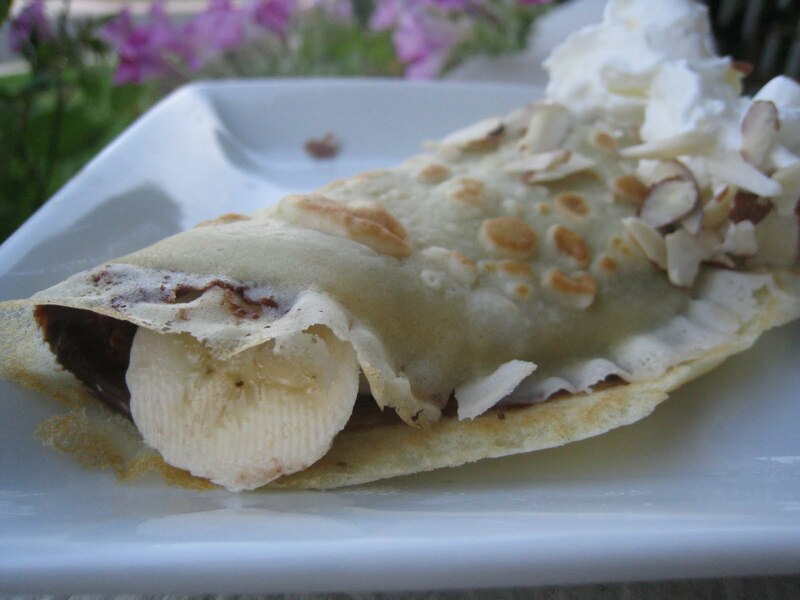 My hubby loved crepes with ham and cheese while I preferred the sweet with Nutella and bananas. This recipe is incredibly easy but a non-stick pan is a must! Note: For the dessert crepes, I spread a thin layer of Nutella on the crepe and then added thinly sliced bananas. You can garnish with whip cream and sliced almonds. Another delicious variation is Nutella and fresh raspberries. For savory crepes, I have put a slice of aged cheddar, thinly sliced turkey and spinach leaves. Fold crepe over and put in saute pan over low until cheese melts and turkey and spinach are warmed.